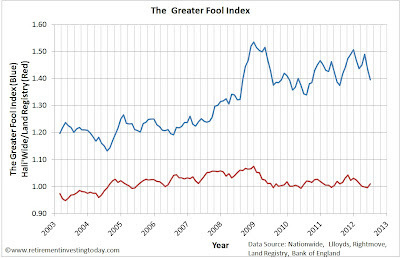 This is the monthly update of the Greater Fool UK House Price Index. This is a unique feature which to my knowledge is only available on Retirement Investing Today. The background to this House Price Index is available here. The Rightmove House Price Index. This index tracks asking prices of properties as they come onto the market. Asking prices in July were £242,097 which month on month is a fall of 1.7% and year on year is an increase of 2.3%. The Halifax House Price Index. This index is based on buying prices of houses where loan approvals are agreed by Halifax Bank of Scotland. Sales prices in July were £162,619 which month on month is a fall of 0.4% and year on year is a fall of 1.3%. The Nationwide House Price Index. This index is based on buying prices of houses where loan approvals are agreed by Nationwide Building Society. Sales prices in July were £164,389 which month on month is a fall of 0.8% and year on year is a fall of 2.6%. The Land Registry House Price Index. This contains the house prices for all transactions in England and Wales. This includes both mortgages (which the Halifax and Nationwide would be included within) and non-mortgages (cash transactions). Sales prices in June were £161,777 which month on month is an increase of 0.1% and year on year is an increase of 0.9%. There is a timing shift between these four indices. Firstly, a house is placed on the market for the first time (the Rightmove Index). Secondly, somebody possibly buys the house using a mortgage (the Nationwide and Halifax Index). Finally, the purchase is registered with the Land Registry (the Land Registry Index). The best estimate of this timing shift is shown in the chart below which is taken from the paper by Robert Wood entitled A Comparison of UK Residential House Price Indices. The chart below then shows an overlay of all the indices incorporating this timing shift. It uses the Land Registry house prices as the baseline date. 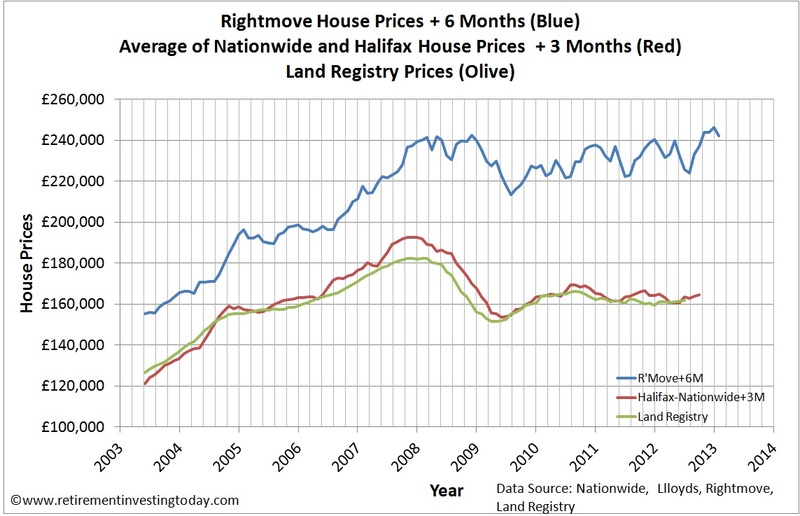 I then average the Nationwide and Halifax house prices in an attempt to increase the accuracy of the dataset and move the data forward by 3 months as that phase occurs 3 months before the Land Registry. 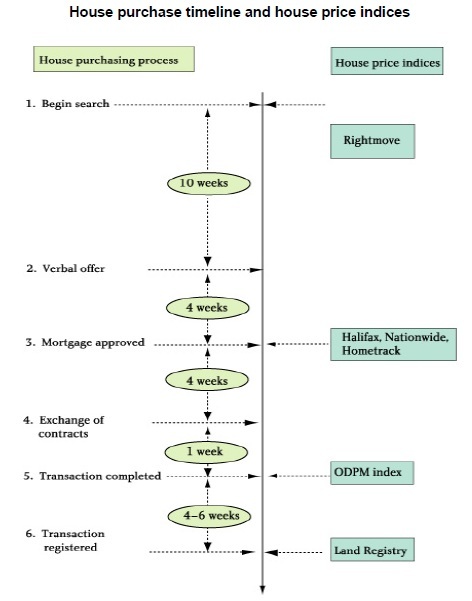 I then also shift the Rightmove house prices forward 6 months as that phase occurs 6 months before the Land Registry. By doing this we should be able to fairly compare each of the indices with each other as we should be comparing the houses and prices from approximately the same period. 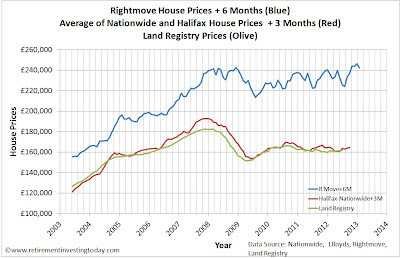 This chart shows that the Nationwide-Halifax and Land Registry Prices are approximately in line with each other while the Rightmove data is not even close! What continues to amaze me is that even though we all know that house prices have fallen from peak (the Land Registry, Nationwide and Halifax all tell us this), Rightmove sellers continue to think that today their houses are worth what they would have been marketed at during the peak of 2007 and an absolute country mile above the peak average sales prices as represented by any of the other datasets. The chart below then shows these datasets converted into two indices. The first is the ratio of the Halifax-Nationwide datasets to the Land Registry (the red line). The second is the ratio of the Rightmove dataset to the Land Registry (the blue line). This tells us that on the average Rightmove sellers are today over pricing their properties by 40% which is a fall from 44% last month. Sellers therefore continue to wait for the Greater Fool to come along. 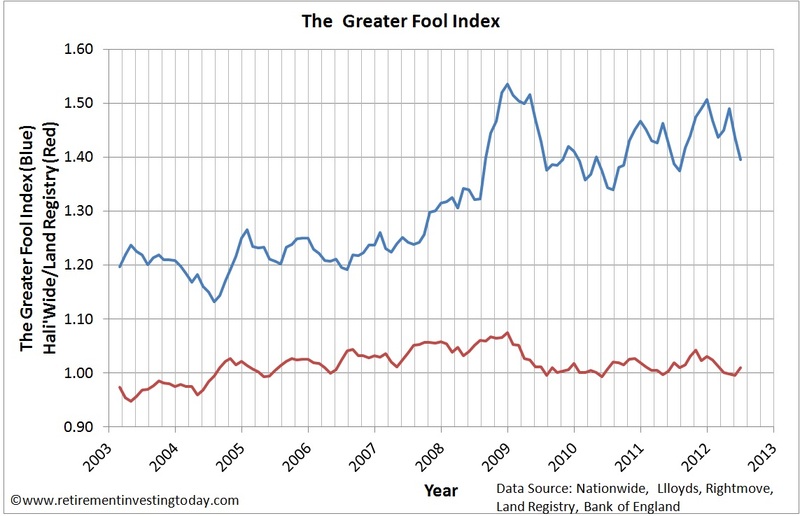 The Land Registry data however suggests that unfortunately there remain far less Greater Fool’s than sellers as volumes remain low at 41,244. This is only 30% of the May 2002 peak of 135,330. I like to think I am not a Greater Fool so remain out of the UK property market. If you’re interested in UK Housing you may also like the monthly UK House Affordability Update. Rightmove use a simple mean average of all new listings to create their average price. Halifax and Nationwide don't list an average price at all. But rather use hedonic regression to create the average price of a fictional "typical house" which is assumed to be a 3 bed terrace or semi. Land Registry also does not provide a simple average (they stopped doing so some years ago) and now use repeat sales regression which of course excludes all the more expensive new builds. There are of course other average price indices which do provide an average price of sold houses, DCLG (now ONS) does, as does Acadametrics. However as both those average sold price indices are over 200K and usually within 5% to 10% of the Rightmove average price, I can see why you'd choose not to use them. There is only one monthly report which does show the average sold price as a percentage of asking price, and it's the Hometrack report. Which currently shows (from memory) the national average discount is around 8%. Of course, there is a huge difference between the discount given on houses that do sell and the premium being asked for on Rightmove for houses that won't sell. Thank you for your detailed post. You make some interesting points. However, before I reply can I say that this site operates on mutual respect for all and is a place where we are all learning. It would therefore be appreciated if more professionalism was shown in future posts. Your reply makes some good points. I looked at including the DCLG data however this site is all amount long run datasets. Unfortunately, this data is of no use as it is supplied with the following caveat "Note that the weights used for mix-adjustment change at the start of each calendar year (i.e. in January). The mix-adjusted prices are therefore not comparable between calendar years, although they are comparable within each calendar year." I also would have liked to use Hometrack however they only state % changes and don't give actual pricing data. Do you know of a place where the raw data is freely available? Thanks for pointing out Acadametrics. I was not aware of this dataset and will look to include this in the next monthly update once I learn a bit more about it. A quick glance shows it uses Land Registry data as it's basis and the latest price listed for July 2012 is £225,769. Using this Index would therfore suggest that Righmove sellers are over pricing not by 40% as indicated by the Greater Fool Index but instead by a more reasonable 7%. Also it suggests that property prices are only down 2.6% from peak. Thanks for highlighting this dataset as it may just provide an excellent housing indicator for myself and Retirement Investing Today readers. That is good information. Could you point me to your reference to help knowledge building? Of course, the Rightmove dataset is initial asking prices (so includes houses that sell and don't sell) and does not adjust the data if sellers subsequently reduce their prices. I use the Property Bee plug on Rightmove and I can say that anecdotally I am now starting to see quite a lot of properties starting to reduce their prices but have no more data than that. As before, I can't contribute much more than anecdotal musings, but I find these posts interesting so I'll comment anyway! One thing that we can probably never see from any dataset is the amount of properties that are removed from the market without selling, which I guess will impact the Rightmove data, but not the Land Registry data. I've spent a couple of years viewing properties here in London without ever quite taking the plunge. What interests and puzzles me is the large proportion of these properties that have disappeared from the market, yet never shown up in the "sold" data. I'd put it at about 20% sales and 80% mysterious disappearances. Those that have appeared as sold were either among the few that were relatively realistically prized in the first place, or sold at a large discount to asking price. Again, this is all anecdotal and I hesitate to draw conclusions, but I can only surmise that sellers continue to have unrealistic expectations, and are backing out of the market when reality dawns, if they have the option to do so. Apologies if you took my earlier post as "unprofessional", but in the spirit of sharing knowledge hopefully you can see the inherent bias in naming your gap between Rightmove and Haliwide as the "greater fool" index, when the comparison is invalid. They measure two completely different things. One is an average of asking prices. The other is not an average price at all, and doesn't claim to be. There is no 40% gap between asking and selling prices, yet you again describe it as such in this months update. The other indices which do show an average price, (as opposed to a fictional "typical price") show the gap as being more like 7% or 8%. So while it's fair to say successful buyers continue to negotiate around somewhere between 5% and 10% off the asking prices of houses, it's a tad misleading to suggest that average buyers are achieving 40% discounts from asking prices. And as I'm sure both you as an author, and your readers, are interested in accurate research and data, I trust you will now revise that assertion in future posts. Thanks for stopping back in. I have not changed this post since you last commented nor have I yet made a new post. For various reasons my attention has been elsewhere for now. I do however want to get back to house prices in the near future and will definitely include the Acadametrics as a further dataset alongside the others as I mentioned above. Please note that I am not for a minute suggesting that buyers are achieving 40% discounts from asking prices. I am simply suggesting that there are potentially a lot of sellers who have priced their houses not to sell. This is resulting in a lot more sellers than buyers. The Land Registry, Nationwide and Halifax Indices are all tracking each other fairly closely. It is the Rightmove Index that is a massive outlier. I appreciate that each uses a different methodology to calculate its "average" but how can one be so far out when compared to the others? Particularly when just a few years ago that gap was as close as 13%. You seem very knowledgable about these indices. Do you work in the industry? What is the data above telling you? I'll not have time to answer the above re methodologies in depth for a few days, but I'll pop back in at some point to do so as it's an interesting subject. But I will quickly address your last question just now. What is the data above telling me? 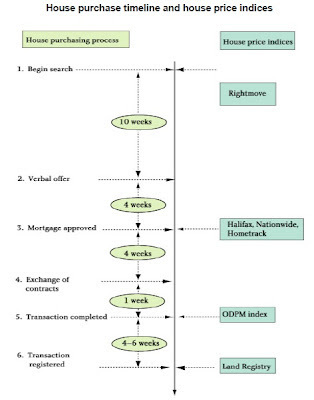 In short, Rightmove is the simplest of all indices. It doesn't mix adjust property types, it doesn't weight adjust by region. It's just a simple mean average of initial asking prices of all houses listed on Rightmove. The simple mean average price, (non mix adjusted), of the houses on Rightmove is diverging from the mix adjusted prices of the other indices because the sales mix is changing. The others are correcting for it, and Rightmove is not. So what you're actually seeing in Rightmove is mostly not a rise in asking prices at all, but rather a change in the mix of properties listed to a more highly priced average. Which funnily enough is exactly what you'd expect in a market where little is being built, marketed or sold at the bottom end, as most of those buyers can't get mortgages. When fewer entry level properties are listed, and the percentage of entry level properties constitutes a smaller share of the market than it did previously, then the simple mean average (as used by Rightmove) must surely rise. Whereas a mix adjusted index of selling prices would, by definition, remove that skew. That's why we see Rightmove rising when actual selling price indices are stagnating. Which interestingly enough means it's probable that at some point in the future, when lending to FTB-s returns and the sales mix changes, we are likely to see the Rightmove average falling when actual selling prices are rising. While I do appreciate the creativity of the more inventively named "indices" that seek to make comparisons between inherently non-comparable datasets (delusion index, greater fool index, etc), I trust the above explanation will at least give you pause for thought before continuing down a path which is almost certainly a red herring if accurate analysis of the housing market is your goal. Thanks very much for the detailed knowledge sharing. I feel that your theories and analysis on this topic could provide an excellent opinion on what is really going on in the property market today. You certainly know more about this topic tha I do. Would you be interested in writing a guest post that I could then share with the Retirement Investing Today Community? If not that's ok and a more in depth comment would be highly valued. If you would be interested in sharing your knowledge of the methodologies and opinion a 600 to 1,000 (or more as I quite often ramble on) word post would I'm sure go down well. It would also give readers a different view point so would I'm sure be valued. For now though I'd just like to pick up on this thought - "which funnily enough is exactly what you'd expect in a market where little is being built, marketed or sold at the bottom end, as most of those buyers can't get mortgages." Are you saying that bottom end housing is just not being listed on Rightmove (it doesn't have to sell) as people know nobody will be able to buy? I'm struggling to think that the general public are that intelligent. Yes, I'd be happy to write a guest post in due course. As for bottom end housing and the general public, it's not a matter of intelligence. Nor indeed one of choice. It's simply a matter of "computer says no". People in negative equity, or on a self cert mortgage, or on an I/O mortgage, or with less than 15% equity, simply can't get another mortgage for the most part, and so cannot move house. And that accounts for probably 50% of the FTB-s since 2006. The rest will be on such good old-style mortgage deals, they'd be mad to move house. As despite what the banks say, porting a mortgage is virtually impossible these days. Now while it's true to say "mortgage prisoners" (who really can't sell), or "LTV trapped" (who would be daft to sell) are only around a quarter of the total housing market (at a guess), they're also hogging all the stock that traditionally would churn very quickly. The FTB houses... And believe you me, most of these houses never make it as far as being listed. Initial enquiries to EA's, and a quick call to the bank, is as far as it ever gets for most of them. If they really need to move, the house goes straight to rented. Combine that with the fact that there are significantly fewer entry level new flats, houses, etc being built, and so also not being listed on Rightmove, and that the ones which are being built are no longer entry level as the builders change their output away from FTB products that they can't sell, and towards bigger houses that they can sell, and it's more than enough to swing the figures by a few percent. Thanks for the response. You bring a very different viewpoint. No rush but when you're ready to publish your viewpoint just send me an email (my address is in the top right sidebar). I really look forward to reading what you have to say.